My views on the books I have read. Please leave your feedback on what you thought of the book, as well as what you think of my thoughts. This is one of the books on my 2014 reading challenge. I have to admit starting this book I was worried. Over the last year or so I have read an awful lot of young adult Dystopia that has sprung up since the success of the Hunger Games franchise. A lot of the books were formulaic, following the same young girl, same dangerous situation, a love interest and an evil government hell bent on subduing the masses all with not a lot of substance. At first glance this book seemed like it was going to follow suit, however, Joelle Charbonneau has successfully crafted a society and a government that has a creepy and distinct "Dystopia." It is more brutal than Uglies by Scott Westerfeld, and the main character has more depth than the protagonist in Divergent by Veronica Roth both of which are both stellar examples of this genre. This is the Dystopia that distinguishes itself from the others just by the sheer quality of the writing and the plot pacing. The plot follows Malencia "Cia" Vale who is graduating school and hoping to be selected for "The Testing" which would allow her to attend university and escape the possibility of spending the rest of her life fixing tractors. What follows is a sinister testing process in which the 108 applicants are whittled down to just over 20 successful applicants. Cia must try to survive with her friend Tomas. The United Commonwealth where Cia lives does not seem to be a bad place to live, it is picking up the pieces of a shattered world, and actually doing it quite well. However the state and the education system are separate and it is the Leader of the university that provides the villain. The book is brutal, People die both by their own hand and by our heroines. 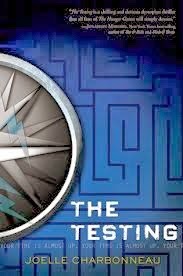 The final test shows the true colours of many of the testing candidates and Cia is a hell of a lot more modest and introspective than a lot of the heroines from other books. All in all this is one of the best in the genre. In fact I'd probably say that it is the best since the original Hunger Games book and it has reawakened my interest in the genre. Squirrel Seeks Chipmunk - David Sedaris. David has read 23 books toward a goal of 75 books.